Find out the process involved in turning wheat into flour. This knowledge could help you start a business of flour milling. If yours is a simple flour milling business, you can mill flour that comes to you. Manual and electric grain mills for use in the kitchen, which can also be used as flour mill, are available at $100 to $700 inclusive of shipping. Two of the features that affect prices are the material of the mill, the noise level and their adjustability. Those made of stainless steel, operate with low noise level, have lower heat production, generate less dust in the air, and can be adjusted for fine or coarser output cost more. Metal and plastic materials are preferred over wood. The recommended milling rate is 40 lbs. of fine flour per hour. But if you intend to supply graded flour, you would have to take care of wheat cleaning and wheat conditioning prior to milling. Wheat cleaning involves grading of the wheat according to certain characteristics and blending some grades to obtain the desired flour. Wheat, depending on their protein content, is classified as soft wheat, medium hard wheat and hard wheat. The type of wheat will determine whether it would be ultimately used for bread, biscuits, or pasta, or something else. Wheat conditioning involves adding a certain quantity of water, and allowing the prepared wheat to stand for several hours. Then the actual milling process begins to produce flour, wheat germ and bran. 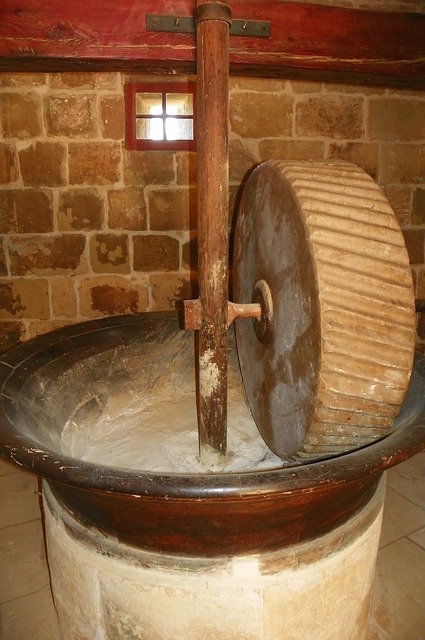 The flour is then bagged and usually stored for several days to age prior to delivery to makers of biscuits, pasta, crackers, and other baked goods. You can also sell the bran and wheat germ to makers of breakfast cereals or animal feeds. If yours is a commercial-scale business, you would be dealing with wheat breeders or farmers, wheat traders, suppliers and the end users of flour. High-level processing would involve more sophisticated inspection and equipment (such as magnetic separator, aspirator, de-stoner, disc separator, scourer, and sifters) and specialists, like a chemist. It would also involve larger spaces and infrastructure. Before starting flour milling business check the regulation of your town or state to determine what permit and certificates you need to secure. Of concern in this process is the dust particle generated from the milling and the risk of an explosion caused by the suspension of flour dust in the air. For smaller quantities, this is not a concern, but for larger volumes, care should be taken to prevent this from happening. You can operate your own full-blown paper business. Start your own pulp mill business by learning about the ways on how you can succeed in this type of industry. please help me know what i need to start up a commercial flour milling company. you have to first think about the suitable location for your business, from where you can get the raw malarial and supply it easily. what are the basic requirements to start flour mill and what is the total expenditure to start. I want to start my own flour mill in CIDCO Navi Mumbai area. i want detail information of documentation and procedure of various departments for NOC and total Cost estimate Including Machines Etc. i want to know that what is the profit margin in flour milling business. 1. what is the type of machinery required for this type of business? 2. what is scope of this business? 3. i want mainly to know about wheat flour? 4. is there any long or difficult process to start flour business? 5. with a capital of rs 10-15 lakh it is sufficient? 6. my location is dewas and neighborhood places? 7. in how much quantity how much flour can be made? 8. what is the cost of getting it packed in a jute bag(50 kg)? Hi, I'm actually interested in knowing the following; what is the type of machinery required for this type of business? what is the cost of getting it packed in a jute bag(10,20 & 50 kg)? Hi, i want to know that what are the things needed to start a flour mill company & the initial investment needed for it. please give me the full details for starting this business. I want to start in Dhanbad, Jharkhand. 1. can it help in FMCG market ? 2. how i can make contract to fmcg companies ? Dear Sir, i would like to start business of flour mill in my home town in sonipat, Haryana. Now. So regarding these information please help me how i can initiate my business in my home town 1. How can I get the help from reputed flour mills in supplying the final products? 2. how i can make contract to fmcg companies ? 1- what is the basic qualification/experience to start the business? 2- how much is total expenditure for it? 3- government rules & regulation? 4- is it there will be some source for loan? 5- how is the market condition for flour millers because of shortage of wheat? i am interested in setting up a flour mill in nigeria i am graduate in agriculture and i am passionate about fighting hunger unemployment although i do not have enough money to set up and banks here do not lend but we can go into partnership i am expecting to hear from your orgnisation thanks. i want to start a floor mill in my city dharuhera, rewari, haryana. but i am not aware of cost involved, procedures of NOC & equipment needed. We want to start this project at Revadi, haryana. n will distribute the same to all ncr areas. Hi,Sir/Madam. I want to establish a flour mill in kushinagar, uttar pradesh, INDIA and need to know about the land requirement, the total capital needed, margin money, loan process and subsidy for establishing a flour mill. 1. Complete design & layout of flour mill. 2. Best Quality and Production . 3. Proper Guidance in selecting the best of all machines available in the market. 4. Well experienced team of technicians to ensure the smooth running of plant. For more information please feel free to contact: Mr. Mangu Sharma ( Head) (+91-9873452121). Thanks Amit Sharma (+91-9818439192) Project Engineer Jai Hanuman Flour Mills Consultant. Faridabad. India. may i want setup a commercial flour mills. on location India-Rajasthan-Bhilwara please tell me expenses, what machinery are used for flour mills. I would like to set up a plant of flour mill in Koderma, Jharkhand(India) but dont have any idea regarding this. So please help me that how much money it will take for setting up of this plant. Hi, i'd like to start a medium scale flour milling business in Rwanda. could u pls furnish me with all the details of whats needed. Pls to sambinyanya@gmail.com or samnyab@yahoo.com. Thank you. I am buying a 30ton capacity factory that has not worked for a while, what shall i look out for on the production line. I would like to set up a plant of flour mill in Bhilwara Rajasthan(India) but dont have any idea regarding this. So please help me that how much money it will take for setting up of this plant. - is the location suitable for this business? Hi! respected sir i wants to know the complete procedure of erecting a flour mill, its pro & cons the departments involved in it, my location is KASUR, PUNJAB, PAKISTAN. dear sir i want to establish small flour mill plant has been capacity 2000 to 3000 kg in 8 hours please tell me about all details of establishment and cost of plant thanks. 1) How much space does it required? 2) How much is cost of flour mill machine? please tell me total investment required item wise to install atta/flour mill. Hi. I'm Sachin i would like to start a flour mill project in Meerut (U.P) related parties who can help me out in this project please contact me chaudharysachin.01@gmail.com +91 9027247591. Thanks. I want to open flour mill in my village which is 15 KM far from city on national high way-2 mathura uttar pradesh india. kindly suggest for finance investment & machinery required & other required information. regards yogesh sharma. i wanna start flour mill in sadik abad, pakistan. please give me total cost estimate for a better flour mill. hello sir, I have my factory at uttaranchal, pauri , and i am a resident of delhi want to start my factory in food processing or floor mill.. please guide which one is better option from both of them with less investment.. and how to set up plant. and other requirements... if any in set up.. I want to set a new flour mill at ubauro along G T road distt Ghotki sindh as raw material is easily available for the purpose. let me know how much it cost? i m shah abhijit from shirpur maharashtra. please forward me a complete project report of roller flour mill for aata, maida @ 30mtpd. I want to open flour mill in my village which is 15 KM far from Baghpat, 40 KM from Ghaziabad & 35 KM from Delhi on Delhi Saharanpur national high way Baghapt uttar pradesh india. kindly suggest for finance investment & machinery required & other required information. regards Brijpal Singh 9999725640. Nanded, mahashtra, India. I have to open commercial flour mill company . Am the student of college of technology. plz tel me all necessary info. On ankade555@gmail.com. Dear Sir, i wish to open a flour mill near Lahore. can u please tell me the minimum requirement of flour mill along with the minimum capital requirement. My email address is: ammarkhalidch@gmail.com Lahore, Punjab, Pakistan. Hi, This is viral nayak from india. I want to know the whole details to start my own small unit of flour mill or specially of maida flour. Please send me the information that i can start the business. How much investment need, Which machinery will need.... etc. Please send the answer as soon as possible. Thanks, Viral Nayak. Dear Sir, i want to open flour mill in near surat (GUJRAT)i dont have much idea about mill. pls suggest me. i have 4000 sq yards land. thnx. We at Aremit Global Resources are experts in Wheat, Corn/Maize milling technology. For Flow Sheet Design, Set up requirements, Flour quality advisory services, out sourcing of milling machines, Project Management, Installation & commissioning supervision, Staff training, and all related functions; please consult us. Send your detailed requests to email: aremitresources@hotmail.com, or call Mr. Luke on +971 566950637. We are based in Dubai, United Arab Emirates. Hello every one i am Danish Kawatra from Centrifugal Castings (India)based at Malerkotla, Punjab, India . We manufacture highest quality FLOUR MILL ROLLS in India. For any query please contact us at +91-9878066600, centrifugalcastingsindia@gmail.com. i want to install a modern flour mill of a capacity of 50-100 tonnes/day. i want to know the total expenditure for installing, starting and running of a business, is there any subsidy by the Indian government.